Mr S S Rathore is a civil engineer and obtained his Bachelor’s Degree from L D College of Engineering in Ahmedabad in 1978 with a Gold Medal for at Gujarat University. He worked as Executive Engineer in the Department of Roads & Buildings of the Government of Gujarat, followed by other roles such as Superintending Engineer and Chief Engineer. He was promoted as Secretary to Government of Gujarat in 1997 and became Principal Secretary in the year 2006. Mr Rathore has served as the Chairman of the Gujarat State Centre of The Institution of Engineers (India) for the period 2004-2006 and has been a Member of IEI Council since 2004. He was also the Chairman of Water Management Forum of the Institution during 2008-2011. He was elected Vice President of the Indian Roads Congress in 2000 and became its President in the year 2003. He has led many pioneering and major infrastructure projects. The national Ministry of Road Transport and Highways appointed Mr Rathore as a Chairman of Sub-Group on State Roads for Formulation of Eleventh Five-Year Plan in 2006. He was appointed Chairman of the Sub-Group for the Twelfth Five-Year Plan also. 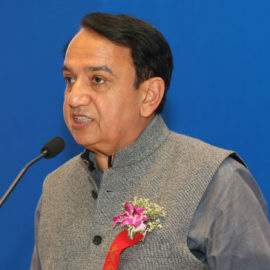 Presently working as the Principal Secretary to the Government of Gujarat in the Roads and Buildings Department, his field of work includes construction and maintenance of road network and important Government buildings. Mr Rathore is the Chairman of the Gujarat Road and Infrastructure Company Limited and Director in Gujarat Industrial Development Corporation, Gujarat State Road Development Corporation, Gujarat Tourism Corporation and Gujarat Water Infrastructure Limited. Mr S S Rathore is the immediate Past President of The Institution of Engineers (India), the National Member of WFEO for India.